There are a plethora of metrics, statistics and factors that can affect the SEO ranking of your website. SEO stands for search engine optimisation and is the process of improving the structure and content of your website so it ranks higher on popular search engines such as Google and Bing. This is an important aspect of web development and any advantage a business can use to improve their rankings should be given serious consideration. If a business’s website has low search engine rankings, this will ultimately mean their site has less exposure and traffic than a high ranking site. Click Through Rate is one area that has been suspected to impact SEO. For example, if 1000 users viewed an ad banner on a website and 321 clicked it, the CTR rate would be 32.1% (321/1000 *100). Web developers and analysts use this statistic to measure the effectiveness of things such as adverts, particular pages on their website, and scrutinising AdWord campaigns. Why Do Search Engines (Google) Monitor Click Through Rates? 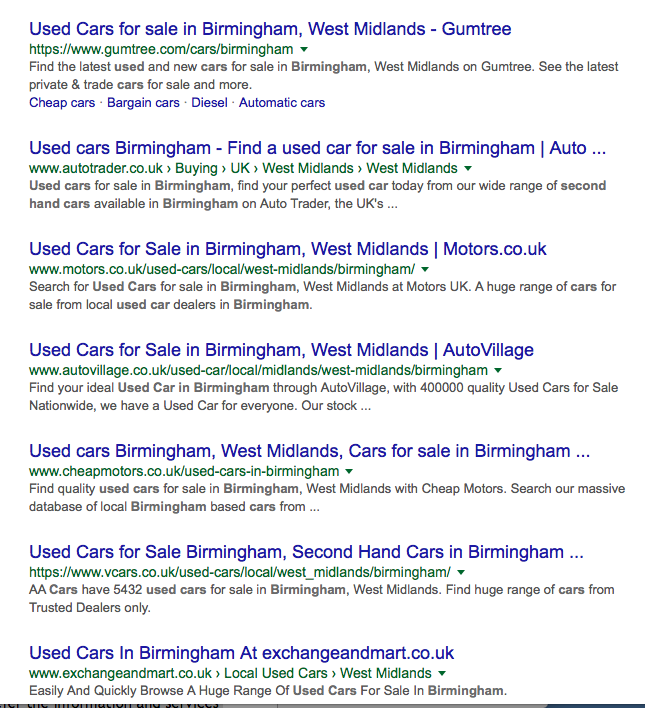 Consider this made up example: Google has ranked the top 5 websites relating to the phrase “second hand cars in Birmingham”. Imagine that the top two ranking sites have great SEO and relevance, but sites 3-5 actually receive a much higher click through rate. Users prefer the information and services provided in websites 3-5, therefore, should they not take precedence over sites 1 & 2 despite their superior SEO? In essence, click through rate provides an additional metric that measures the success and how useful a website or a link is to the user. Search engines will take into consideration this statistic and give greater weighting to those sites that have fantastic SEO AND have high CTR. Aside from giving greater credence and viability to your SEO rankings, CTR is also a useful analytical tool to measure your website and advert performance. For example, you have two advert campaigns running simultaneously and you wish to measure their effectiveness. Advert 1 has a click through rate of just 14% whereas Advert 2 has a much higher rate of 25% – this clearly shows that advert 2 is out-performing advert 1. As a result, you may need to scrap advert 1 altogether to maximise budget spend, or look at why it is under-performing and amend it accordingly. As you can see, click through rate is a hugely important statistic that should be given due consideration when analysing your website’s performance. This simple metric can improve your SEO rankings and give your website greater exposure, but it can also help you fine-tune your marketing campaigns and advertising strategies.